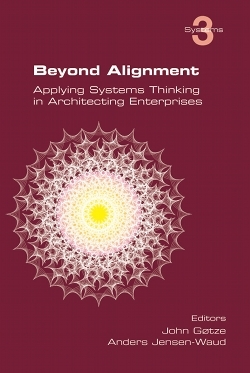 Beyond Alignment: Applying Systems Thinking to Architecting Enterprises is a comprehensive reader about how enterprises can apply systems thinking in their enterprise architecture practice, for business transformation and for strategic execution. The book's contributors find that systems thinking is a valuable way of thinking about the viable enterprise and how to architect it. Edited by John Gøtze and Anders Jensen-Waud, the book features contributions from 32 international experts in the fields of systems thinking and enterprise architecture. Adrian Campell, Alex Conn, Dennis Sherwood, Don deGuerre, Erik Perjons, Gene Bellinger, Harold "Bud" Lawson, Ilia Bider, Jack Ring, James Lapalme, James Martin, Jan Dietz, Jan Hoogervorst, Janne J. Korhonen, John Morecroft, Leo Laverdure, Linda Clod Praestholm, Mesbah Khan, Mikkel Stokbro Holst, Namkyu Park, Olov Östberg, Olusola O. Oduntan, Patrick Hoverstadt, Per Johannisson, Per-Arne Persson, Peter Sjølin, Rasmus Fischer Frost, Sally Bean, Tom Graves, and Tue Westmark Steensen. The harnessing of complexity in systems engineering begins with an understanding of the intertwined social, economic and technical nature of the problem. Successful systems engineering practitioners know that instinctively, and they act accordingly. This book examines enterprise architecture and systems thinking as the generalized model and method for dealing with complexity in systems-of-systems engineering, holistically addressing all aspects of the problem. We live in a complex world of systems of systems, and enterprises must work beyond organizational boundaries. Value chain integrations and cross-system dependencies brings about many concerns, and, frankly, many problems, in both operations and architecture. We need to learn new ways of finding root-causes to such problems, and that is exactly why this book is so timely and useful. Enterprise Architecture is now becoming a common sense for the future digital enterprise. An enterprise can now be seen as a system which needs to interoperate with its changing environment. Interoperability is a property of a system (an enterprise) that has to collaborate with any known or unknown parties. Alignment of the related models is then a crucial need that goes beyond the simple fact of modelling. This books provides the reader with valuable insights for thought on the strong relationships between enterprise architecture and system thinking. I would recommend it to anyone who wants to deeply understand the challenges in this moving environment. University of Lorraine (France), Research Centre for Automatic Control, CNRS. Chair of the IFAC Technical Committee 5.3 on Enterprise Integration and Networking.